Media Access Control (MAC) Address is a unique identifier assigned to each network adapter of any device. A Linksys router has a Wireless MAC Filter feature that lets you permit or prevent users from accessing the wireless network by allowing or blocking computers or device MAC Addresses. This article will guide you on how to find the MAC Address of the Linksys Range Extenders, RE6400, RE6300, RE6700, RE6500, RE4100W, or RE3000W v2 for the Wireless MAC Filter feature of your router. NOTE: If you're using a Linksys RE7000, click here to locate the MAC Address for MAC Filtering configuration instead. 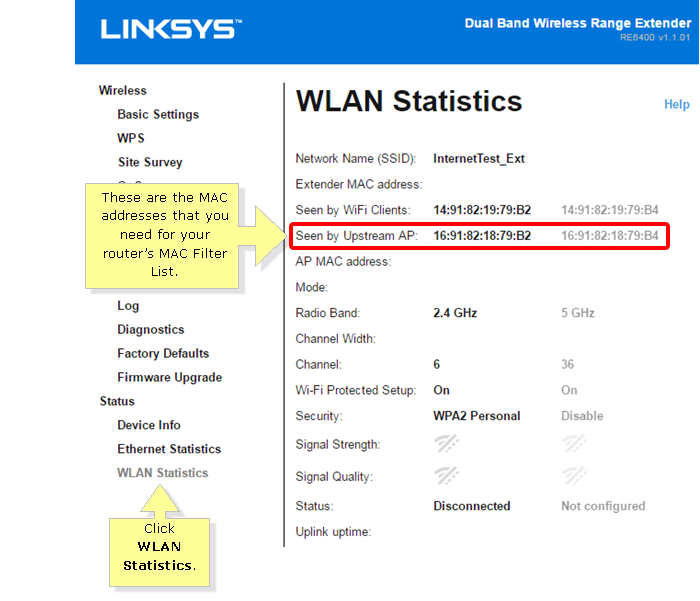 Click Status > WLAN Statistics and look for the Seen by Upstream AP section. These are the MAC Addresses you will add to your router's MAC Filter List. NOTE: If your range extender's web-based setup page looks different from the image below, make sure to update the device's firmware to the latest version. You may now proceed to configuring the Wireless MAC Filter feature of your router. Click on the links below to know how.